After retiring from the workforce, many elderly people are at risk of becoming isolated at home, which can leave them lonely and depressed. However, there are some simple things they can do to prevent post-retirement depression. Harrisburg at-home care experts examine 5 of these simple strategies. The human mind craves structure and routine. After retirement, the lack of having somewhere to go can seem unsettling and leave your loved one feeling like there is no direction to his or her day. Try creating a daily schedule for your loved one that includes time for exercise, errands, meeting with friends, and household chores. This can help him or her feel a sense of accomplishment at the end of the day. If your loved one needs help maintaining a schedule, consider hiring a Harrisburg home caregiver. Volunteering for a favorite charity or organization allows your loved one to use skills and knowledge while giving back to the community. Knowing others are depending on him or her can also provide a sense of purpose and increased self-esteem. As a bonus, the mental stimulation can also help keep your loved one’s cognitive skills sharp. Most people get their social contact through work. 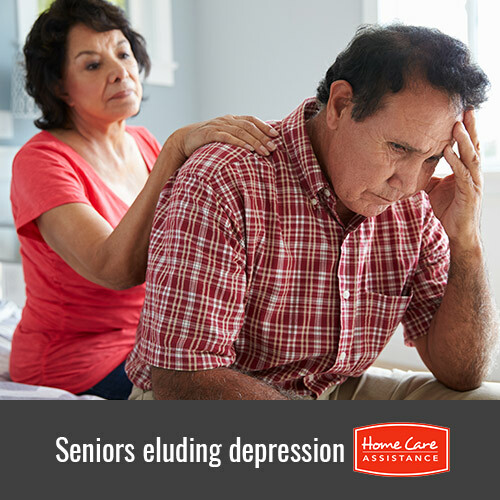 When those connections go away after retirement, your loved one may become isolated and withdrawn, which can lead to depression. Retirement is the perfect time to create new circles of friends by exploring new hobbies or activities. Your loved one should consider signing up for a senior sports team, taking an adult continuing education class, or joining a reading group at the local library. Retirement can bring its own set of concerns. It is natural to worry about finances or even getting sick, but worrying too much can lead to depression. Encourage your loved one to compartmentalize his or her worrying by setting aside 5 minutes a day to think about these issues and take proactive steps to address them. For example, your loved one should schedule an appointment with a financial advisor if money is a top concern. No two retirements are the same. Your loved one should not feel he or she has to spend the golden years the same way as a neighbor. Instead, he or she should decide what is important and find a way to make it a reality. For some seniors, this may mean traveling the country in an RV. For others, the perfect retirement may include spending as much time as possible with the grandchildren. The key is to encourage your loved one to pursue his or her dreams. Social companionship is one of the most effective ways to alleviate loneliness and depression. At Home Care Assistance, our compassionate caregivers make wonderful companions, and they can also assist with a variety of essential everyday tasks. In addition to respite and 24-hour care, we also offer stroke, dementia and Alzheimer’s home care Harrisburg, PA , seniors can count on. For more information on our in-home care services, call (717) 540-4663 today.